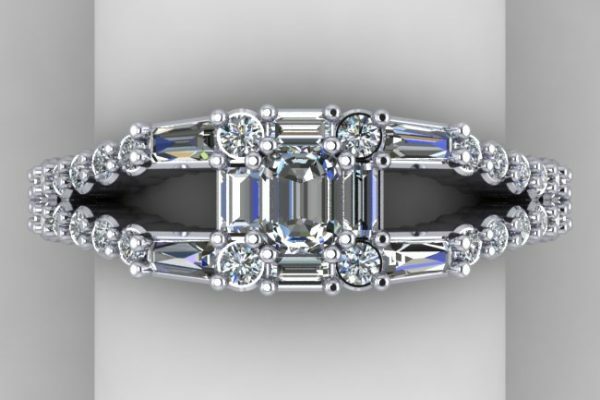 We thought it might be fun to follow a custom jewelry design job from start to finish, so that you can see the steps involved. We are pleased to share this story of our longtime customer and friend Vicky. 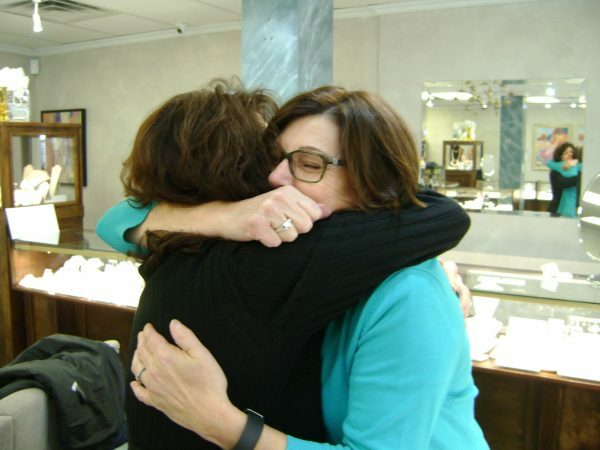 With over 26 years of experience in custom jewelry, Barbara personally works with each customer to design a piece that reflects their style and wishes. 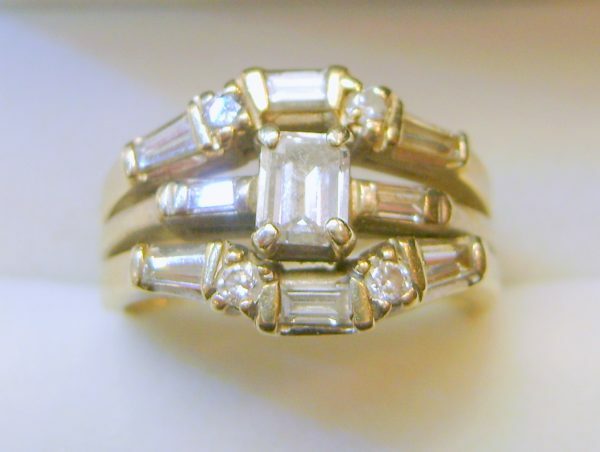 Vicky’s mother’s wedding set held enormous sentimental value to her and a host of wonderful diamonds: 8 baguettes, 4 round diamonds, and an emerald cut center stone all set in 14K yellow gold. There was just one problem: Vicky never wore the rings. Now, Vicky realized: Either she could let the rings keep rolling around in the back of her jewelry box, out of sight and out of mind. OR, re-purpose the original stones to create something that better mirrors her own style. We were pleased Vicky asked us to re-purpose the stones into something new, and not just because we love to design jewelry. We know how close Vicky was to her Mom,and how much a new ring with her Mom’s diamonds would mean to her. When Vicky came in, we sat down and started brainstorming. Vicky wanted a ring that could be worn on her right hand along with a more contemporary look in white gold. I drew up a few ideas, and we kicked them to the curb until we had a design that Vicky loved. 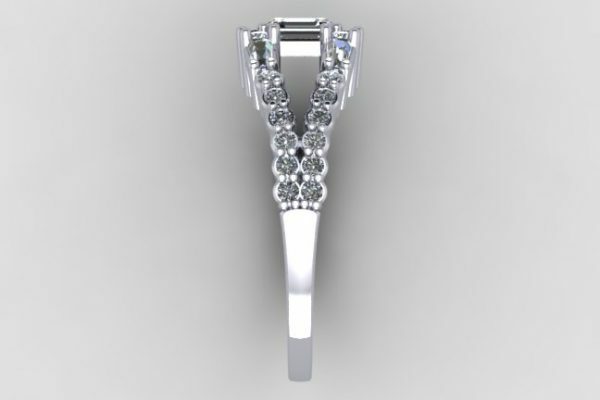 Vicky decided on a split shank to give the ring a more contemporary fashion look, and then we grouped the original diamonds together for a bigger, more sparkly center. 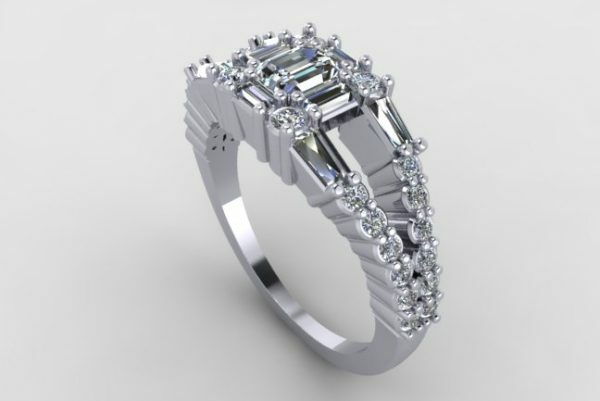 Based on our ideas, a CAD (computer assisted design) of Vicky’s new ring was created. CAD brings a new level of proficiency into the custom jewelry design process today. Photo realistic renderings provide views from a variety of angles and offer an accurate look at what the finished piece will look like. The CADs gave Vicky an opportunity to look more closely at the design. After some careful consideration, Vicky requested that we bring the baguette diamonds that adorn the split shank closer together. We made the tweak, got Vicky’s final go ahead and then put the piece into final production. If you are a fan of technical information, please read on. If not, please skip this section and feel no guilt. 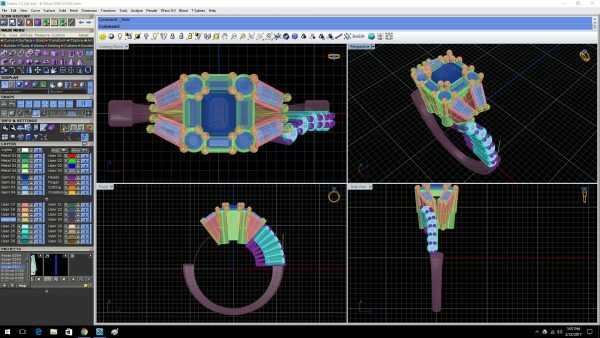 The vividly colored wire-frame shown at left is a CAD design that is a dimensionally accurate representation of Vicky’s new ring. 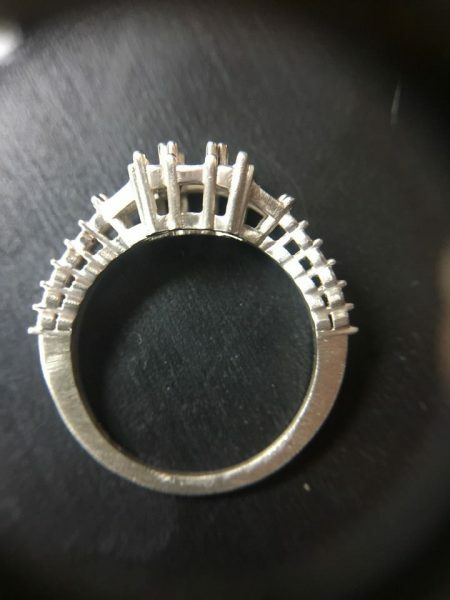 This file was sent to the 3D printer, which created a wax model of the ring. n where the wax was burnt away, leaving the cavity into which the casting technician poured 14 k white gold alloy. Once the gold cooled, the plaster was broken apart, and there was Vicky’s new treasure, shown at right as a rough casting. Any surface imperfections were hand polished out, and then the stones from Vicky’s mom’s ring were set, giving the ring instant good karma. Next came rhodium plating, a final polish, inspection, and a final review. Now comes my favorite part, the reason I love doing this. 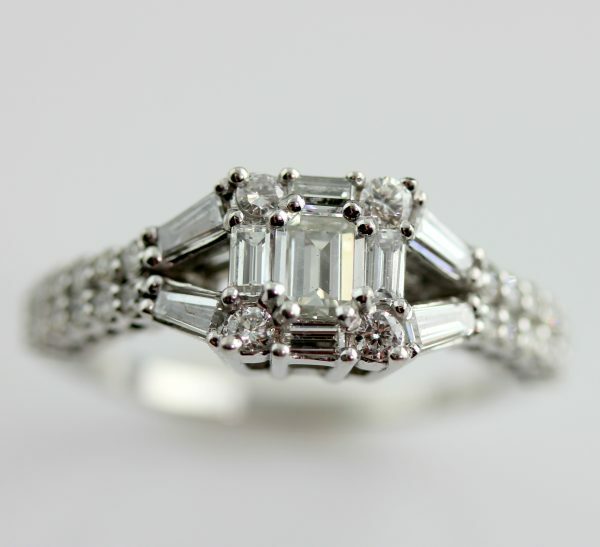 Jewelry is all about the celebration in someone’s life that is a constant reminder of that special moment in time. Please stop by our shop if you are in the Buffalo NY area. We’d love to meet you and help you create that special piece!